As of 2013 all companies belonging to the group controlled by Zhejiang Geely Holding Group Company Limited, which include: Geely Automobile Holdings Limited, Geely Automobile, London Taxi Company (formerly Manganese Bronze Holdings), Volvo Personvagnar AB and Drivetrain Systems International. In this case 100% of London Taxi Company, 100% of shares in AB Volvo Personvagnar and 1% of Geely Automobile is owned and managed directly by the Zhejiang Geely Holding Group Company Limited. The company's founder and chairman of the board of directors - Li Shufu (Li Shufu). Geely first Chinese automakers participated in the motor show in Frankfurt IAA'2005 and in the International Motor Show in Detroit (USA) NAIAS 2006. Today, Geely - this is one of the ten largest car manufacturers in China, is investing heavily in research and development activities as well as training and development of its staff. In South America, Chile, Colombia, Uruguay, Paraguay, Brazil, Costa Rica and Peru. Geely cars are produced at 18 plants, 9 of which are in China. as well as car Institute of Technology in Zhejiang, which is the first higher education institution in China, specializing in the preparation of masters and doctors in the field of automobile production. A two professional design studio in Barcelona and Los Angeles led by chief designer Peter Horbury (previously worked with Chrysler, Volvo, Ford, Lincoln, Jaguar, Aston Martin and Land Rover) are able to provide a product the world with an interesting, independent and memorable design. Geely has been certified and works in accordance with international certifications: ISO9000, TS16949, ISO14001, ISO / IEC27001, OHSA S18001, GCC, EEC & ECE. In 2008, Geely Geely based model (LC) Panda completed the development of its electric Geely LC-E, with a maximum range of up to 80 km at a speed of 65 km / h. Parallel Geely developed and presented in the framework of the Beijing Motor Show 2008 concept electric Geely (FC-E) EEBS, and in 2009 signed an agreement with Yulon Group co-production electric vehicles. At the same time at the Shanghai Auto Show Geely introduced two models of electric cars Geely Gleagle EK-1 and Geely Gleagle EK-2. Both models are also built on the basis of Geely models (LC) Panda, and have a cruising range of 80 km and 150 km respectively. In 2011, under the Shanghai motor show Geely Geely McCar electric with built-in electric scooters and power reserve of 149 km. In 2013, Geely introduced the world Geely EC7 EV electric vehicle with a power reserve of 258 km, developed jointly with Detroit Electric. At the same time in the next 2014 Geely planned to launch a series EC7 EV, but several worked with the power plant production car was launched in November 2015. 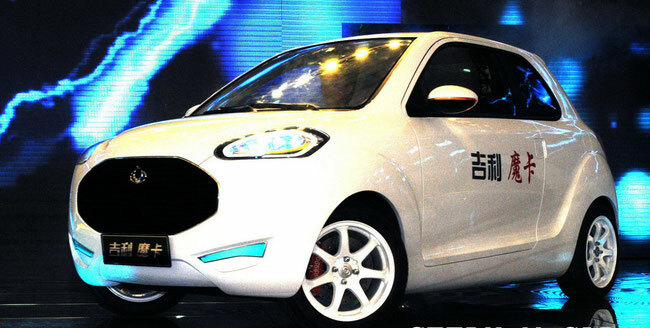 Cruising serial electric Geely EC7 EV is 253 km, but when driving at a constant speed of 60 km / h the car is able to overcome 330 km. Geely to work on their own electric car - it's not just a fad, or check their own capabilities, but concrete plans. So in 2014, Geely acquires British startup electric Emerald Automotive, and until 2020 plans to equip 90% of its lineup of hybrid or fully electric powertrains. The development of this area Geely has already invested more than $ 160 million and do not intend to stop there. Geely special interest in the development of electric vehicles is still in the release of the next generation of taxis as Geely cars used taxis in most of the countries where they are represented. However, it is also due to the fact that the Chinese authorities have set the task of local automakers to reduce by 2020 the average fuel consumption in the model range of up to 5 l / 100 km, which will improve the ecology of much suffering in the country and reduce dependence on oil imports. In this connection, all automakers in China are forced to seek an alternative to the use of only gasoline engine. Geely plans for electric vehicles in the near future: to sell 3,000 copies in 2016, and over 30 000 2017. We have to admit the plans rather bold considering the cost of the first mass series electric Geely EC7 EV at 229800 yuan (or 36 000 dollars) that 3.5 times more than the cost of the gasoline version, which is in demand in China and other markets. For its part, Geely hopes on subsidies from the state, which in China are really in the manufacture, purchase and use of electric vehicles. In addition to finding an alternative to gasoline internal combustion engine in electric vehicles, Geely vengeance engaged in the development of hybrid vehicles and hybrid propulsion systems. As part of the Beijing Motor Show 2014 Geely showed several hybrid concepts: Geely Emgrand Cross Concept and Geely Emgrand EC7 Hybrid. Both models are quite interesting. 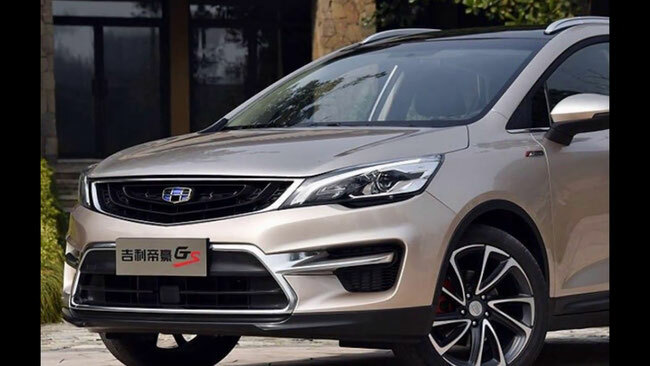 So Geely Emgrand Cross Concept is equipped with a gasoline engine, cylinder capacity of 1.8 liters and a surprisingly modest power of 65 kW (88 hp), and the auxiliary electric motor 40 kW (54 hp). According to the manufacturer accelerates Geely Emgrand Cross Concept to 100 km / h in just 10 seconds, while top speed already 190 km / h. Promise and a good cruising range is 650 km away.The turn Geely Emgrand EC7 Hybrid, built on the basis of normal Geely Emgrand EC7, also has two petrol engine 1.8 liters. but it is unknown what kind of power and an electric motor, is also unknown what power. Here the manufacturer declares only to equip the machine Start / Stop system, the system of energy recovery during braking and that fuel consumption per 100 kilometers in combined mode is less than 5 liters. At the end of 2015 Geely submitted a batch embodiment of Geely Emgrand Cross Concept in Geely Cross S7 models except the hybrid power plant. At first it will be a regular car with petrol engines and then plans to equip it with a hybrid power plant. A somewhat different situation is with the concept of Geely Emgrand EC7 Hybrid: also at the end of 2015 was submitted to electric Geely EC7 EV, which will soon be equipped with more and hybrid, but not yet done. Separately, you can notice more and Geely experiments in this direction, as represented in 2011 Geely Aeolus pneumatic hybrid with a very unusual circuit where the internal combustion engine is used as an air pump. Each cylinder internal combustion engine is connected via a variable valve to the common air tank that allows you to maintain a constant pressure in the balloon. Next, compressed air is supplied to the air motor, which is used to drive the rear wheels. According to the manufacturer Geely Aeolus maximum speed is 90 km / h, with a power reserve of 120 km.